When Michael Pollan first issued his seven-word eating mantra—”Eat food. Not too much. Mostly plants.”—it must have sounded strange to those reared in a world of only iceberg and romaine lettuce. Indeed, I must confess it took moving to California for me to discover the varying tastes and textures of collard greens, kale and mustard greens. But turn to the world of meat, and you still find limited choices for wedding-reception menus: beef, chicken or fish. The only real variation in meat depends on cut. Enter the kitchen of Brooklyn-based hunter Steven Rinella, and one can suddenly choose from squirrel, beaver, venison, black bear, bonefish, sheep or numerous kinds of fowl, depending on what he has in the freezer chest in one closet. 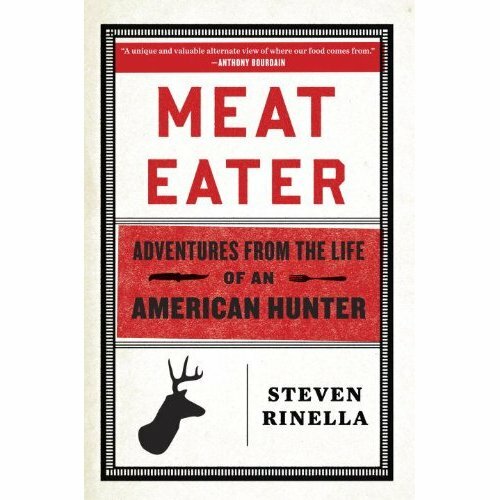 Whether or not readers of Rinella’s new book, Meat Eater, will ever try cooking such meats, he nevertheless intersperses the 11 rambling hunting tales that comprise his book with tasting notes: the way to butcher deer so it doesn’t taste too gamey, the patient cooking of beaver tail that renders it the favored treat of hunters past, the canned soup best for stewing squirrel meat in a crockpot. Not that Rinella wrote a cookbook, mind you. On one level, he’s penned an entertaining collection of the sort of anecdotes that, if you had the good luck to meet him at a Brooklyn hipster’s cocktail party, would be conversational gold. Though animals figure almost as prominently in his narrative as people, Rinella is an astute observer, with an eye for delightfully telling details. But in Meat Eater, Rinella does more than tell stories well and share exotic cooking tips. He writes from the standpoint of a married writer and father living in one of the world’s more densely populated metropolises. His book sets up an implicit contrast between city and wilderness, semi-settled midlife and a more footloose young manhood. The stories also touch on some of the same fundamental changes in the nature of living and working in America that Matthew B. Crawford described in his 2009 book, Shop Class as Soulcraft: An Inquiry Into the Value of Work. Though many men and some women probably share something of the childhood introduction to hunting that Rinella describes so vividly—a youth in which he and his two brothers raise pet raccoons, trap muskrats on nearby ponds and learn to build deer stands—something drives this writer to stake his very bodily existence on these burgeoning skills. Not once but multiple times in the book, Rinella’s ability to catch, clean, butcher and cook an animal decides the difference between hunger and eating, starving and feasting. These stories make clear that successfully completing and carting home a hunt requires varied skills that far exceed Boy Scout basics. Rinella typically makes hunting and fishing expeditions multi-day camping trips to rugged country. The long hikes and sometimes treacherous pursuit of animals require substantial physical stamina and agility, along with the strength to pack out heavy bags laden with gear and meat. The author also possesses a detailed knowledge of terrain and an eye for the sometimes-subtle clues indicating the presence of animals … clues that also indicate the type of animal and how recently it passed. Once Rinella gets close to his prey, success may require skillfully operating a bow and arrow, various kinds of firepower, or an array of fishing lures, hooks and lines. After waiting hours with great patience, often in conditions of physical discomfort, he must act swiftly, accurately and astutely in aiming for the animal. When Rinella successfully kills, he must do the work of a butcher, albeit without sterilized counters or protection from the flies that so bedevil him in the Alaskan summer heat of a sheep-hunting trip. Though the writer never directly brags about possessing all these skills or having so refined them, he tells of using them with an obvious sense of exuberance and exhilaration. Why not? Such stories brim with the experience Matthew Crawford attributes to all manual trades, which he says make one feel “like a man [sic], not a cog in a machine.” The key for Crawford? Manual work “engages the human capacities as fully as possible” by connecting thinking and doing. We don’t get that chance in our culture much anymore. For me, perhaps the greatest opportunity to muster every skill I had for the project of survival came during the leaner half of my season in New York. Life there notoriously resembles an urban game of Survival, and during my four-year stint, I funded my way by knitting scarves, bookkeeping, editing and catering a badly attended political event. Though vague literary ambitions spurred the move, some of my proudest moments came from what I earned with my hands and skills. (You won’t find those jobs on my resume.) Despite the precarious finances that forced me to it, I found living by my wits invigorating. Never before or since has staying alive and off the streets demanded I bring so much of my knowledge and life experience to bear on a task. Now that I have money enough to buy nice bourbon, stationery and yarn, I don’t exactly miss those mostly meatless days, when indulgence meant buying canned beans instead of dry. Yet sometimes, at the end of a weekend spent chopping, canning, baking and trying new alcohol infusions, I feel sad about the endless working hours ahead when I will hunch in front of a flickering screen, my body little more to the job than a pair of eyes and hands serving a brain. A real life, it seems, would demand more of my whole body to survive. Rinella seems to think so too. Though he keeps his Brooklyn freezer amply stocked with meat, he still can’t help catching the odd domestic squirrel that threatens his backyard plot of tomato plants. The squirrel meat is fresh, and it requires more skill to obtain than laying down bills for meat cuts at the Park Slope Food Coop. When grilled with a marinade adapted from chef Jamie Oliver, squirrel makes a very tasty meal for the Rinella clan. Normally, of course, stakes for hunters prove higher, prey larger, exertions greater. The arduous, risky climb up the Alaska Range in search of elusive Dall sheep might end without even a sheep spotting, much less bagging a ram with the horn-curve features that render it a legal kill in the eyes of the state. Even when a hunter does spot and kill a legal Dall, the heat of summer may spoil the meat before the party can pack it back to camp. Rinella writes of this as the “beautiful essence of uncertainty that is to hunting what pan drippings are to gravy.” Satisfaction comes in the uncertainty, and in the seamless, whole-bodied engagement in the task of living. So what are we to do, we writers, Rinella and I, who at best can only draw fully on our bodies in weekend and vacation bursts of labor? Old Spice’s recent “Muscle Music” video provides a kind of answer. The deodorant brand’s latest attempt at interactive, viral video marketing, “Muscle Music” features a nearly naked man seated in an intricately wired, instrument-packed set, his well-toned muscles strewn with sensors. As the viewer soon discovers, his very cheek twitch might bang a drum or blow a flaming wind instrument. He quickly expands from short solos to a cacophony of sound, powered by the increasingly frenetic muscle spasms that give new meaning to the word symphony. Does such wired music-making come from the same mindset that Pollan says drove us to break down whole food into its constituent parts (“nutritionism”) and that Crawford credits with the dehumanization of assembly lines (“scientific management”)? Or does it foreshadow some era of writing by flex and twitch that uses the leg for more than supporting a laptop? In the future, will we find ways to engage our bodies in the hunt for sounds or for words as energetically as Rinella does on the Alaskan slopes? In the meantime, when next I squash a roach or—God forbid—my housemates and I have to once again trap rats, I will think briefly about the victim’s food value. And if I ever have children, I might let them hunt … at least for any creatures that would prey on my vegetable garden.